The lawyers at Alward Fisher Rice Rowe & Graf provide clients across Traverse City, Michigan, with comprehensive legal services relating to banking, business and corporate law, estate planning, and family, criminal and civil matters. Our law firm's mission is simple: to serve clients with prompt, quality legal services delivered by an experienced team of attorneys. With over 100 years of combined legal experience in various banking and business issues and other matters, we have both the knowledge and the resources to assist clients who find themselves in the middle of a variety of legal situations. 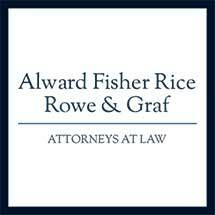 At Alward Fisher Rice Rowe & Graf, we counsel businesses through all aspects and phases of their growth and development. From assisting in the formation and structuring stage, to helping assess the legal, financial and business risks of a purchase or sale of business, to ensuring that a merger or acquisition occurs smoothly, our goal is always to help businesses grow and expand. Our lawyers also take matters relating to banking and creditors' rights seriously. We strive to protect the interests of local banks and regional lenders in commercial lending and loan documentation, as well as individuals and businesses who are borrowing or restructuring loans. We also recognize the importance of experience counsel in estate planning matters. Our lawyers draft a variety of wills and trusts, seeking to effectively represent the complex and unique needs of our clients. We take this same approach with family law issues, providing compassionate guidance through the dissolution of marriage and all the related issues. As one of the largest independent law firms in northern Michigan, we have the resources and knowledge to assist you, no matter the nature of your issue.